A new commuting phenomenon has occurred. K has been home for a couple of weeks (if you'd like to speak to The Gods Of Work re that, it would be nice to hear about a gig for before or after our trip) and I've mostly been riding the train alone. 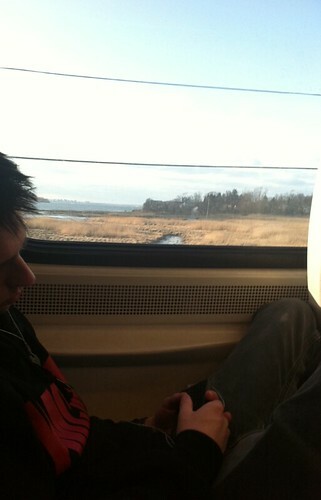 I like to sit near the window and, as you know, I am a small person. Why does this matter? It matters because night after night the Biggest Men In The World decide to sit next to me. You see, if big guys sit near me they can really spread out. I'm not talking about fat guys - that's different. I'm talking about men who are over 6'3" (K is 6'3" and, so, my point of reference) by at least a couple of inches and who weigh upwards of 250 - 300 pounds. In cold weather they have big coats too, and briefcases and Blackberries and, my favorite, iPads. These huge men sit next to me and smush me into either the window or the aisle and proceed to set up a home office. After they finish with their emails several of them have decided to watch a movie. Last week I had a guy cue up The Last Samurai and watch it, without headphones, directly in my face (as my face was at his mid chest level). If that wasn't annoying enough, he fell asleep. It hasn't been all bad. Middle commutes with me two days a week, not that he is stellar company. I do marvel at his sleeping skills though. Yesterday, on the way into town, he said to me: are you done talking to me, cause I'm going to sleep. We had not yet left the station. We met up on the way home and he yawned as we found our seats. I think it took him about two minutes to be out cold. It snowed this morning which had a lot of people in a bad mood but I say how can you gripe when a coworker shows up looking this adorable? I have the same problem on PLANES. I'm small, so inevitably I'm lodged beside a large man and crushed. They're happy, as I can imagine your seatmates are. If the big sitters happened to me every day, or even some of the days, I'd be totally grouchy about it by the time I got to work. Middle sounds like the ideal seatmate, actually. As long he doesn't snore. I'm fascinated by people who fall asleep while travelling. I cannot even close my eyes, I must look everything, everywhere, all the time. That lady looks really nice. big, rude smushers:Ick. i especially hate it when they fall over onto me when they sleep. tho i feel perfectly justified in applying sharp elbow. 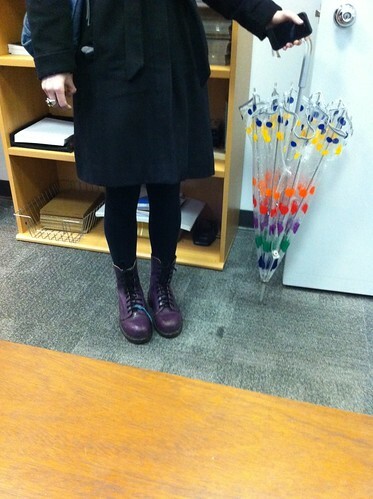 Purple Doc M's make everything better. My love and adoration of Middle never abates. Is fat worse that big? Discuss. Short of your new season fashion discussions, your notes from the commute are my absolute favourite. pleasetobeasking the co-worker about the source for her umbrella. it makes me swoon.